Establishing exact dates and a chronology of ancient Egypt has been one of the most difficult tasks assumed by Egyptologists since Manetho wrote the first modern history of the Pharonic Era in the third century B.C. ; dividing the Pharonic Era into Kingdoms and Dynasties was his most lasting achievement. Since Manetho, several notable historians and Egyptologists have significantly advanced the sequence of rulers with the help of textual documentation such as the "List of Kings" at Abydos and the "Turin Canon" from Lahun. While the sequence of the pharaohs in most Dynasties has come to be fairly well understood (e.g., Amenemhat II immediately preceded Senwosret II, who was followed by Senwosret III), the dates associated with their reigns differ from publication to publication. The concept of co-regencies has added an interesting series of debates that aim to rectify apparent overlaps in rule. This thesis will largely follow the chronology applied in the Oxford History of Ancient Egypt (OHAE), although some dates are adapted to reflect recent evidence. 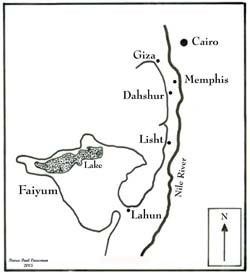 Map of the Faiyum region with key sites (after Grajetzki 2003, fig.2). The Middle Kingdom (c. 2060-1650 B.C.) consisted of three dynasties, the 11th (2060-1985), 12th (1985-1773), and 13th (1773-1650) that generally corresponded with the rise, renaissance, and fall of the kingdom, respectively. As a whole, the Middle Kingdom is known for a core of political unity located closer to the migrating border of Upper and Lower Egypt than during previous dynasties, in the Faiyum and Lisht regions (see map). While many of the specifics of the period remain fragmentary and highly debated, the general historical outline is largely agreed upon. 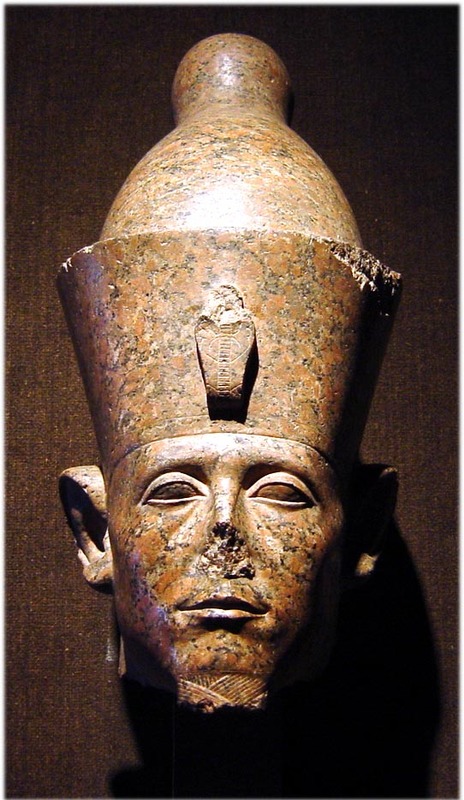 Mentuhotep II (2055-2004) established the Middle Kingdom when he succeeded Intef III (2063-2055) of the First Intermediate period on the throne at Thebes. Mentuhotep's consolidation of power, strong leadership, and re-organization of the ruling class marked the changed from the weak and disorganized rule of Intef. Mentuhotep, moreover, guided the state through at least 14 years of notably violent civil wars against the noble families of a traditional seat of power in Lower Egypt known as Herakleopolis, a feat that none of the pharaohs of the First Intermediate Period could accomplish. By ruling from Thebes in Upper Egypt the pharaoh was in a better position to hold control over the troublesome regions there that had largely contributed to the fall of the Old Kingdom. The pharaoh created or reinstated a series of political posts that began to centralize the power at his capital. Such centralization of power became a constant trend throughout the Middle Kingdom. The next two pharaohs to succeed Mentuhotep II, Mentuhotep III (2004-1992) and Mentuhotep IV (1992-1985), were particularly vigorous in employing builders to construct temples and, perhaps for the first time, projects of general utility as well. During the 11th Dynasty the earliest voyages to Lebanon and Punt were recorded, amongst other foreign centers that would become prominent in later ancient Egypt. The circumstances of the transition from the 11th to the 12th Dynasty, that is from Mentuhotep IV to his vizier Amenemhat I (1985-1956), are somewhat suspicious, although it is unlikely that overt foul-play was involved as Amenemhat was at the fringes of the kingdom, engulfed in battle after battle expanding the state. By most reports Amenemhat was a faithful servant of the pharaoh who took advantage of another person's attempted coup. Gae Callandar, a scholar of Middle Kingdom Egypt, suggests that the lack of a viable male heir or general weakness of the pharaoh permitted one of the high-ranking officials, Amenemhat I, to take power. With the dawn of the 12th Dynasty came the move of the royal court and capital to Lisht in the Faiyum region. Amenemhat I continued to actively consolidate his country’s borders as he had done so as vizier, and usurped the power of the nomarchs. After approximately 30 years of rule Amenemhat I was assassinated and his son and co-regent, Senwosret I (1956-1911), took power. Senwosret I continued the economic and social growth of the dynasty by expanding southwards, sending expeditions to Asia, and for the first time conducting frequent trade with Syria. The "royal mortuary cult" or a supreme reverence for the pharaoh also re-emerged under his rule, although by this time certain rituals previously reserved for the nobility had diffused into the populace. Most notably, Senwosret I’s rule of approximately 34 years established a single unified material culture in ancient Egypt, intentionally reminiscent of the Old Kingdom. The importance of a unified culture cannot be underestimated. When the citizens of a state are allied in their general beliefs and way of life, they are more willing to being directed and governed. Periods of weakness during ancient Egypt were marred by the effects of independent cultural centers grasping for power, which usually resulted in the transition of pharaohs and dynasties. The similarly long rule of Senwosret I’s son, Amenemhat II (1911-1877), appeared to be consistent with that of his father—though less remarkable. The rule of Amenemhat II’s son, Senwosret II (1877-1870), was comparatively short, probably due to his advanced age from the two somewhat lengthy preceding reigns. Yet, these were good years. Under Senwosret II there was a distinct lack of military action—or perhaps only of records—permitting more time to be spent focused on other affairs of the state including a prolific Near Eastern trade and the institution of an irrigation system in the Faiyum region. 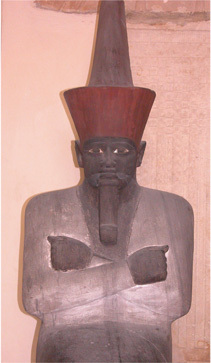 After Senwosret II, what has been called the "high Middle Kingdom" (c. 1870-1777) commenced with the reign of Senwosret III (see image of Senwosret III). As the most "visible" and perhaps most controversial pharaoh of the Middle Kingdom, many of Senwosret III's exploits inspired the development of the Classical Greek heroicized character "Sesostris." The adventures of this semi-mythical person are based on the deeds of Senwosret III, but the tales also include events that happened centuries after the pharaoh’s death. Regardless of later developments, Senwosret III's rule was responsible for expanding the empire in all directions, a massive centralization of government, and a growth in trade and technology among other major social, political, and cultural changes. 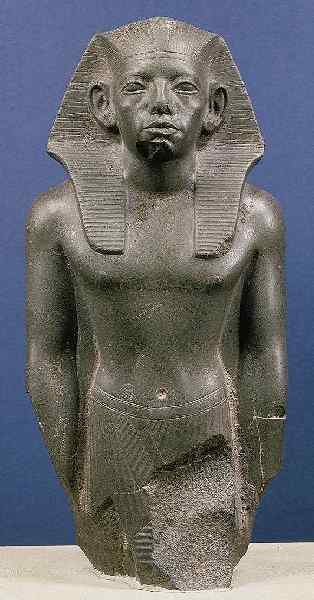 Senwosret III, or Khakaure, reigned for 19 to 39 years with the exact dates difficult to establish. This was, without doubt, a very prosperous time for Egypt. Some of the earliest records of his reign are from his eighth year when the pharaoh had his master builder, Ronpetenenkh, clear a canal at the First Cataract 150 cubits long by 20 cubits wide by 15 cubits deep in order to sail his armies up the river into Nubia. Khakaure personally led his armies to many great military victories and most importantly secured the Nubian frontier up to the Second Cataract. 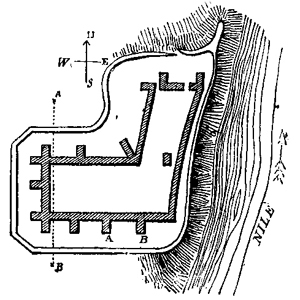 There he established two major forts, Semneh and Kummeh, one on each side of the river. Later, the pharaoh re-extended the limits of the empire up to the Third Cataract at Kerma, which had been reached some 600 years prior but was not able to be controlled. From the trading post he had set up at Aswan and from his fort at Elephantine Island, Senwosret III held the restless Kush people at bay and eventually became a patron deity in Nubia, the land he had ruthlessly conquered. While most of Senwosret’s military activity was concentrated in the south, other monuments recorded his personal ventures east to the Red Sea and Somaliland, north to re-open the copper mines of Sinai, and west into the Libyan Desert. At home Senwosret was continuing the practices initiated by his predecessors to centralize the government around his court. Although attempts were made earlier during the Middle Kingdom to reduce the power of the nomarchs, it was this pharaoh that was responsible for instituting the practices that usurped their remaining power. Senwosret required the male children of nomarchs to be educated at Lisht and then serve the state somewhere detached from their homeland. Nearly all of the nomarchs were personally appointed by the pharaoh and many of their traditional titles disappeared from the archaeological record. Practices such as those mentioned above crippled the succession of the powerful familial nomarchs. Because of the influx in the population of the capital, more positions became necessary to teach the nomarchs’ children and to keep them employed afterward. It is not surprising that during Senwosret’s reign numerous Old Kingdom titles were brought back and even more new titles were created. In order to centralize and keep the powerbase of the state within his court, Senwosret inadvertently created a bureaucracy like never seen before, including the bureaus of Upper Egypt, Lower Egypt, treasury, labor, military, vizier, and "bureau of the people’s giving." Each bureau not only required a head but numerous sub-positions, thus occupying the otherwise potentially threatening nobles. All of these positions came with their inherent restrictions under the watchful eyes of pharaoh and his trusted elite, but also came with benefits. The positions expanded the middle class as quickly as they were instituted. People other than the lavish elite could then afford to prepare for the afterlife in a manner similar to that of their pharaoh. The material record from Senwosret’s reign confirms the participation of the middle class by the frequency of less wealthy burials. Many funerary stelae describe the nature of the deceased’s position within society and eliminate the objectivity inherent in identifying "less wealthy" burials. Distinct trends within the culture and most visibly within architecture and funerary practices emerged based on the changing dynamics of the society. Each scholar that has researched Senwosret III has encountered statues and other stone likenesses of him that, for the first time in ancient Egypt, depicted a pharaoh with non-idealized facial features. Many of the representations of Senwosret reveal the portrait of a worldly man, not a god-incarnate. Also under Senwosret's reforms the middle class began to actively participate in the "cult of Osiris" and the belief of the existence of a "ba" or spiritual force that had formerly been strictly reserved for the pharaohs. 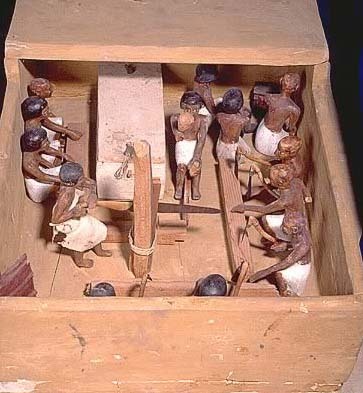 Although not certain, this also appears to be the time when the mummiform coffin was introduced; whether this was directly associated with the status of the state, however, is not known. Carpenter's Workshop Model. Meket-Re Cache. Cultural changes during the high Middle Kingdom could be due in part to increased contact with other societies. Just as Senwosret’s expeditions took him to the physical boundaries of his kingdom, the same expeditions also took soldiers, viziers, nobleman, and merchants alike. An increase in cross-cultural contact was a side effect of Senwosret’s reign. While cultural information was both intentionally and inadvertently traded, technological information would have been as well. Interaction with other societies is reflected in distinct architectural trends from the period. Although the mud-brick pyramids of the Middle Kingdom are viewed by some Egyptologists as inferior attempts to copy the works of the Old Kingdom, Callandar notes that "[the Middle Kingdom] engineers and architects reached great heights of mastery [and] exceeded the considerable skills of their Old Kingdom counterparts." 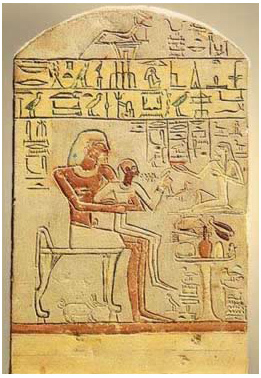 Senwosret III had only one son, Amenemhat III. Building on the vast successes of his father, Amenemhat III reigned for approximately 46 years, bringing peace and cultural expansion to his land. No records of military activity during Amenemhat’s reign are known and it is safe to assume that the active military under his father was largely responsible for preparing the Kingdom for a lengthy period of peace. During this time the pharaoh occupied his people with numerous additions to temples and fortresses to shore up their borders. He also had turquoise and copper mines of the Sinai worked heavily. Towards the end of Amenemhat’s reign there were several years of low floods on the Nile, which stressed the state’s economy. The end of Amenemhat III’s reign marked the beginning of the decline of the 12th Dynasty and the Middle Kingdom. Amenemhat IV, who followed Amenemhat III, may or may not have been his son. Regardless, the new pharaoh ruled for only nine years before his death, in which no major events affecting the Kingdom or Dynasty are known to have taken place. He was succeeded by Queen Sobekneferu who may have been his sister and was probably also his wife. Her four-year-rule seemed to be effective and legitimate, as she is listed in the Turin Canon, but nonetheless she was the last ruler of the 12th Dynasty. Aldolf Erman writes that the kings of the 12th Dynasty raised the Kingdom to a level of civilization never seen before and their prosperity was so great that "it is easy to understand how the later Egyptians looked back to it as a national classical epoch." The opportunity to study and compare complex artifacts from the national epoch to which Erman referred is presented in the Cairo Dahshur boats. The above section is excerpted from The Cairo Dahshur Boats. MA thesis, Texas A&M University: College Station. 2005, by Pearce Paul Creasman. The original work contains citations, not found here, and the thesis should be consulted prior to citing this work.